Langtang trek is one of the most popular treks towards the north direction of Kathmandu. The journey begins by driving to Shyabru Besi (1,500 m.) from Kathmandu along the terrace paddy field and bank of Trishuli river. This trek is popular for its beautiful natural flora and fauna and lush evergreen forest. The settlement here is majorly that of Tibetan people migrated to Nepal. Hence, people here look like Tibetan origins, and their culture is similar to Tibetan too. The itinerary include Langtang valley, Langtang Lirung (7,200 m.), Nayakang Yalla Peak (5,700 m.), a day hike on Tserko Ri 500 m and Kyangin ri (4,800 m.) Langsisa Kharka. Ganja la pass is 5,122 m. from sea level. It is adventurous pass from Kyanging Gumpa which leads to a completely different region in Helambu. Helambu is a beautiful village with Hyolmo people. 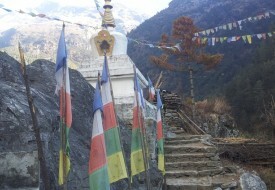 Tharkghyang Monastery, Sermang and Melimche pul bazzar are special features of this place. The trek is of 14 days. Day 06: Trek to Kyangjin Gompa (3,870m) 3/4 hrs. walk around.